A step towards economic diversity: It is no secret that the Kingdom of Saudi Arabia has been recently working on expanding its economy beyond the energy and petroleum industry. Due to the recent downfall of the petroleum prices, the Arabian Peninsula’s biggest kingdom decided to shift its significant economic dependence on the energy sector to other industries. The Neom City project comes as a major step towards achieving that. 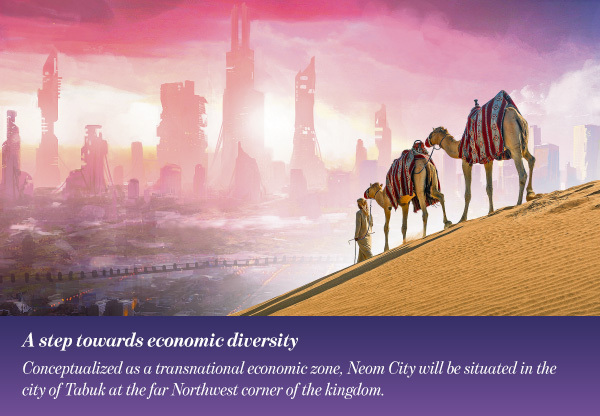 Conceptualized as a transnational economic zone, Neom City will be situated in the city of Tabuk at the far Northwest corner of the kingdom. The city vast area will be the first to extend across the borders of three different countries as it will include lands within both the Egyptian and he Jordanian borders. The city’s name is derived from two words: the Latin word Neo (meaning New) while the letter M is an abbreviation for the Arabic word Mostaqbal, which means future, making its name a short of New Future. A Hub for the Future: Neom City will span 10,000 square miles (26,500 square kilometers) with a coastline that extends for 486 kilometers along the coast of the red sea. Assigned an estimated budget of more than 500 billion dollars, the megacity project comes as the first step of the kingdom towards the post-oil era. The city comes as an integral part of Saudi Arabian Vision 2030, a 15-year plan conceptualized by the royal prince and the heir of the Saudi Arabian throne Mohammed Bin Salman that aims at developing several industries and economic sectors in the country to shift the sustainability of the Saudi Arabian economy away from the unstable energy and petroleum sector. The first phase of the giant project is expected to be finished by the year 2025. It is worth mentioning that Neom City is going to be independent from the governmental body of the Saudi Arabian kingdom as it will have its own regulations, tax and labor laws. Through doing that, the city aims at being the global future utopia-like hub for nine key industries that are alleged to shape and define the future of the world: energy and water, mobility, biotech, food, advanced manufacturing, media, entertainment, technological and digital sciences. 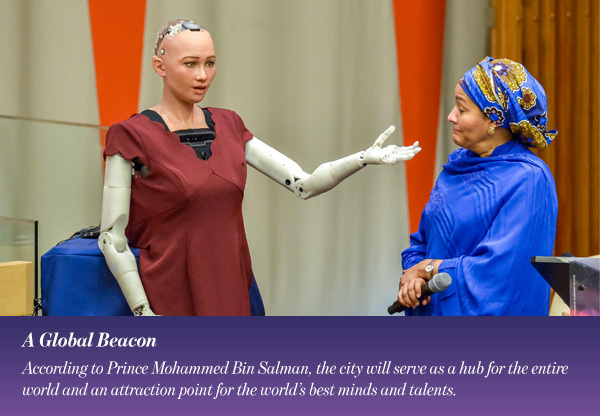 A Global Beacon: Unlike the other megacities – finished or under construction – in the Kingdom of Saudi Arabia, Neom City’s main purpose is not to generate new jobs for the youth of Saudi Arabia. According to Prince Mohammed Bin Salman, the city will serve as a hub for the entire world and an attraction point for the world’s best minds and talents. This makes the megacity a huge shift not only in the Saudi Arabian economic strategy, but also in its social and cultural norms. For many decades, the Kingdom of Saudi Arabian has been famous for maintaining very conservative social and cultural environment. Being branded as a global city, the promo video of Neom City features scenes that the Saudi Arabian society has been unfamiliar with for a long time like a ballerina and an orchestra. Such a change will help Saudi Arabia in attracting the western investors which has always been a challenge due to the kingdom’s conservative environment. 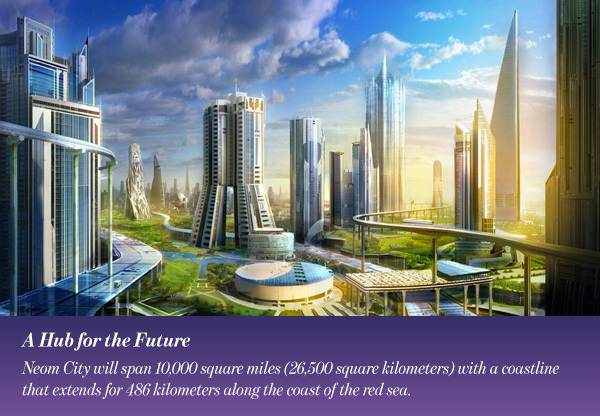 The futuristic dream city also promises to feature robots in numbers that are equal – if not more than – its speculated population while powering itself solely with renewable energy sources (solar and wind energy). All the processes and services of Neom City will be fully automated to reach the utmost possible level of efficiency. Strategic location: As it will be developed on the coast of the red sea at the geographical meeting point of Asia, Africa and Europe and near the bridge of King Salman which will link both Africa and Asia, Neom City will overlook the gateway through which almost 10% of the world’s shipping trade passes with a terrain that comprises mountains that reach up to the height of 2,500 meters and a climate that is 10 degrees Celsius lower than the rest of the kingdom. Also, because of its independent governmental structure and laws, the city will offer its investors and citizens many lucrative incentives and flexible investment and tax laws. Challenges and Competition: While Neom City project sounds promising by all means, the experts speculate that it might be too ambitious because of the competition it would face that will only get fiercer through the upcoming decade. 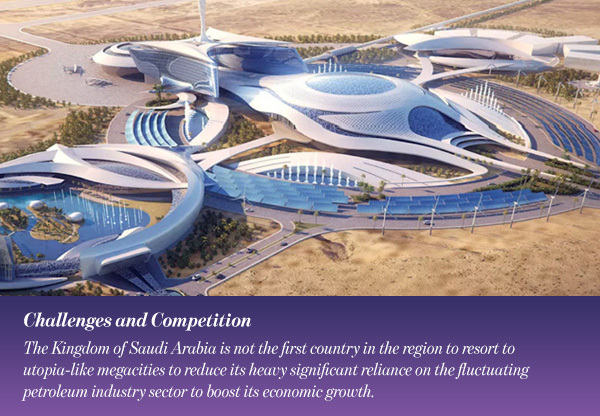 The Kingdom of Saudi Arabia is not the first country in the region to resort to utopia-like megacities to reduce its heavy significant reliance on the fluctuating petroleum industry sector to boost its economic growth. As a matter of fact, Saudi Arabia might be one of the latest Gulf Cooperation Council (GCC) countries to join the race of the future metropolises that has been always spearheaded by the emirate of Dubai in the UAE. Thus, there are a lot of regional competitors that Neom City will need to maintain a strong significant competitive advantage over to successfully attract the foreign investments it needs to be completed and to flourish. In the present time, there are similar futuristic mega cities that are either merely conceptualized or under actual construction in Kuwait (Madinat Al Hareer or Silk City), Qatar (Lusali City which will host the 2022 World Cup Tournament), Sultanate of Oman (Duqm) and UAE (Masdar City). 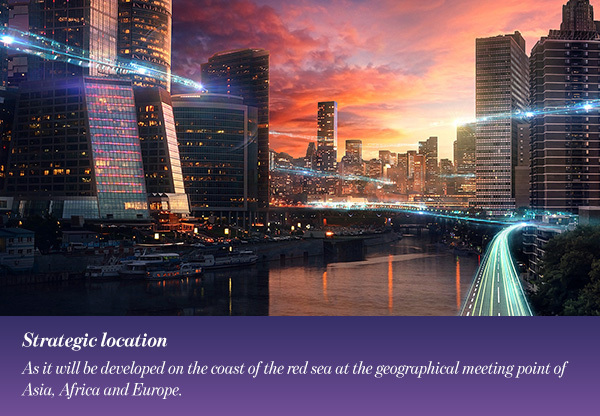 But then, the unique location of Neom City on the crossroads of some of the vital international trade lines and the full automation of all of its services and processes are participating actively in branding the city and making it stand out in the region. It is safe to say that Neom City, upon its completion, will be a competitor to reckon with among the futuristic megacities in the Arabian Gulf.